Prime For Scientific and Technical Supplies - How Does a Microscope Work? Composite light microscopes consist of two lens systems: one eyepiece toward the eye and one toward the object-side objective. The objectives are the most important and valuable part of the microscope, because their quality is critical for determining the overall performance of the microscope. Achromatic objectives consist of compound lenses made of different materials. This makes it possible to correct longitudinal chromatic aberration for two colours, i.e. the varying focal points of several different wavelengths. Apochromatic objectives are corrected for three colours and the deviation of the image location for the intermediate colours is very small. Objectives that are used to correct the curvature of the image field are referred to as plane objectives. The eyepiece acts as a magnifying glass and magnifies the intermediate image of the objective. Wide-field eyepieces have a larger field-of-vision number than normal eyepieces. The field-of-vision number is the diameter of the object field in mm multiplied by the magnification factor of the objective: an eyepiece with a field-of-vision of 18 mm with a 4x objective yields an object field with 4.5 mm. Plane eyepieces smooth out the image field similar to the plane objectives. 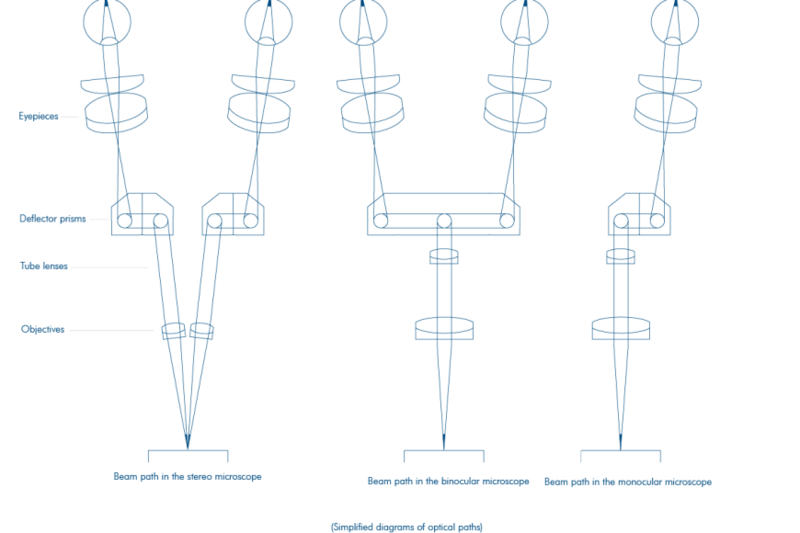 Modern light microscopes are basically categorised as monocular, binocular or stereo microscopesdepending on the number of eyepieces and objectives. Monocular microscopes have one eyepiece and one objective and are the most simple type of microscopes. Binocular microscopes have two eyepieces and one objective. They provide for fatigue-free working as microscopes with one eyepiece. However, they do not allow for three-dimensional viewing of the object. Stereo microscopes have two eyepieces and two objectives, which can, however, be combined to form a main objective and thus project a separate image of the object in each eye. This allows objects to be viewed three dimensionally. In biology and medicine, the object is usually illuminated with transmitted light before the light passes through the objective. This is referred to as transmitted light microscopy. In incident light microscopy, the light is cast from above onto the object and is reflected back into the objective. Incident light microscopy is used for the microscopic examination of opaque objects. The Köhler illumination makes it possible to illuminate precisely the object area that can be overlooked. This prevents unnecessary stray light from illuminated parts of the object that are not in the field of view. 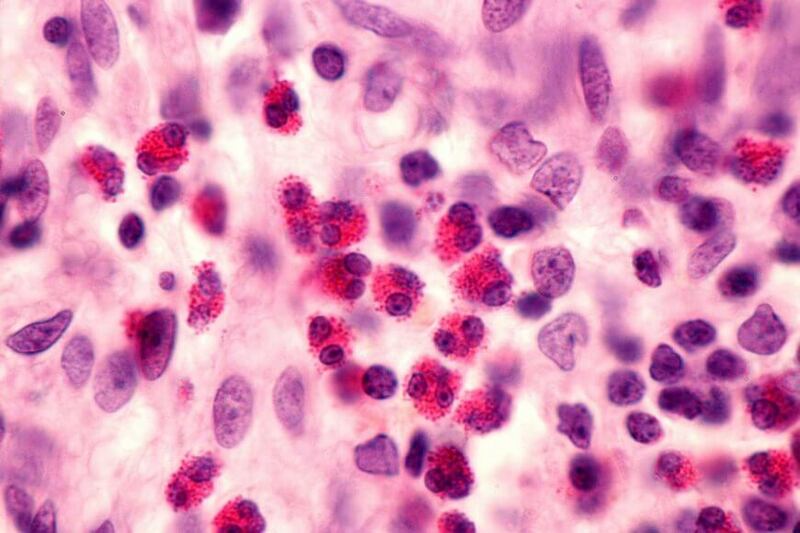 Dark-field microscopy is used to examine objects that are particularly lacking in contrast such as micro-organisms or red blood cells. The dark-field feature directs the light at an oblique angle through the object, past the objective. The light that is refracted from the object hits the objective where a bright image is then produced against a dark background. This makes it possible to see outlines of objects that are normally mostly transparent. Phase-contrast microscopy was developed for the microscopy of particularly transparent objects. Transparent objects are, for the most part, optically denser than the surrounding medium and therefore create more resistance to the light. The light is therefore slowed down, which results in a phase shift when it exits the object again. This phase shift is used to create a brightness contrast. This also requires a ring aperture in the condenser and a phase ring in the objective which must be calibrated to each other.